Vity's Freerapid is quite awesome too. Very fast and light, monitors the clipboard (I find browser integration to be more annoying than helpful), fancy window decoration is optional instead of mandatory (thankfully), recognizes a lot of hosts from the links, batch links and downloads, etc. I'll add a new section for download managers exclusively for downloading from file sharing services. Eagle Get has won me over. once it gets reviewed no doubt it gonna make this list. I stuck with FDM as it's been my favourite for a long time, but it does have problems integrating reliably with portable browsers. A couple of weeks ago I discovered that Eagleget has a portable version to I decided to try it and haven't looked back. Browser integration is excellent - for portable Firefox it's a simple matter of finding the xpi file in Eagleget's directory and dropping it into FF and it even works very well with less mainstream browsers like Maxthon and Avant. I have to say I've been very impressed with it so far. My only complaint really is the ridiculously huge (to me at least) buttons on the Metro-style GUI ... if there was an option for small buttons (or even better, a choice of basic Win32 GUI) it would be perfect. I'd also like more user-control over categories but that's not a deal breaker as I don't really use them anyway. Thanks for the pointers George, I hadn't really looked very hard as auto-grouping isn't something I really use. It still seems to be impossible to delete the pre-set groups though. What does happen, is that when I start a new session the monitoring options in EG have disabled themselves and have to be reset. This might be an aspect of the portable version I guess. It's very usable for me anyway, as I don't need anything that permanently monitors my browser. Just something to handle large/numerous downloads which might potentially be interrupted by a browser/system restart. I did see the beta version but I'm quite happy with 1.1.8.2 at the moment. FDM is excellent, I agree. It's been my favourite for several years. There's a v5 alpha version by the way, which is available for testing on the FDM forums. Thanks for sharing your experiences on the portable version. The last stable version of EagleGet is 1.1.8.3, although the portable version is available only for 1.1.8.2 The default categories can't be messed up in the stable version but from what I've seen it's possible in 2.0 Alpha. I've also seen EagleGet monitoring sounds in GMail, I've set it to exclusion list to get rid of it. Whole heartedly agree with that. 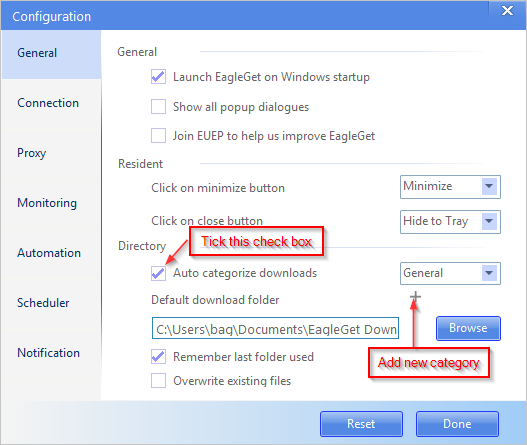 EagleGet 2.0 alpha is incredible and has included features that are only available mostly in commercial download managers like Multiple queues with synchronization, refreshing expired links for broken downloads, support for all browsers, outstanding browser integration for video downloads. Some of these features are already available in the stable version, and some to look forward to. Don't forget the FlareGet for Linux either. It's the only one for me that hasn't broken an ISO download when one wasn't available as a torrent. MC - Site Manager. Yes I'd be reviewing FlareGet but on Windows for comparison with other DM's, it's been simply incredible on Linux. I'd be doing a 1 week testing for each DM, that'd probably take me 10 weeks to complete the review for all DM's in the To Be Reviewed section. Something that I don't get is that, I'm able to get 16 connections multi-threaded download on FlareGet on Windows even though it's a feature that's been advertised as Pro only. Probably the limitation might be only on the Linux version? Can somebody test it on Linux, because I don't have Linux, from where I'm writing this comment. Currently I am running free download manager. I am thinking to switch to flareget as like fdm its clean install but also gives HD video download that is not there in fdm. I couldn't find much info on flareget for windows. There are many for linux version but not much info for windows version. Is the windows version stable & works good, both file & video downloads? Is the download speed good? Does it install other software i.e any dependency software? How does it compare with fdm? You should restart the system after install then it mentions only 2 segments allowed if the file size is bigger than 25mb. I didn't liked & uninstalled. The installer is clean, the interface is appealing, file downloads worked great along with the scheduler. It allowed only 2 segments for files >25MB, which is one of the major disadvantages. About video downloads, I was able to download Youtube videos on Firefox but not any other site. It didn't work on Chrome. I'm not sure if it's because I'm having a 64bit system and the plugins haven't installed correctly. Honestly, wasn't as great on Windows as it was on Linux. Although I still got few more days to review it fully. I tried on Win 7 64. Latest Internet Explorer & Chrome. The downloads worked on Chrome but not on Internet Explorer. Video downloads too didn't worked on Internet Explorer. And on Chrome it downloaded the videos from Youtube but the file/icon looked white like a paper & didn't played, gave the window "Open with". I tried couple 720p videos & have VLC latest installed. I can confirm that this restriction is operating on Linux. MC - Site Manager. Thanks. On deeper testing I also found that FlareGet uses only 2 segments for files >25MB. I tried quite a few free download manager/accelerator. FDM & Eagleget are bloat free i.e no additional softwares & are good. All the others have additional softwares/ads or limited features. But I liked IDA i.e Internet Download Accelerator. During install it gives an option to install a software (guess its their own software) but the good part is, its Opt-In. It also gives an Opt-Out option for home page change to their site. After install, everything was fine. The only thing is the ads cannot be disabled but can be set to check in 3 days. The download window also have ads on the upper bar but thats not a prob IMO. "The best part of IDA is video download has option to download in HD, that can be preset & also can be changed in the download window, for the supported sites. Options like 1080p, 720p, 480p, 360p, MP3, etc." Any other download manager has such option? Anyone running IDA can tell me how often ads are served if set to check in 3 days & are they obtrusive? Connection type/speed doesn't have my speed option i.e 4mbps so I have selected 20 mbps & above & no probs downloading, any adverse affect if I keep this selection? How is DAM i.e Download Accelerator Manager? I installed it & was a clean install i.e no additional softwares/ads, etc... Only minus point is the free version doesn't allows to set download speed more than 3x. The min speed is 1x & max 20x. Dont know if the 3x speed will be fast enough. Plzz review IDA & DAM. Will be waiting for your review. Is Eagleget a chinese vendor product? I couldn't find the company info on their website or google. Yes I'll be reviewing all the download managers in a few weeks time. I've added the list of download managers that's to be reviewed here. If there's any good one that I've missed out, please let me know. I think EagleGet is from a Chinese developer. Not sure though. CAUTION! GetGo Download Manager infects badly computers. It took me ages to figure out what was causing my malware infection. And if you uninstall it, the normal way, you get other problem. So I had to remove each registry entry... Anyway, I also ditched FDM which I used to love because I noticed on my firewall some illegal activity even when I was not using FDM. Same thing with Orbit. 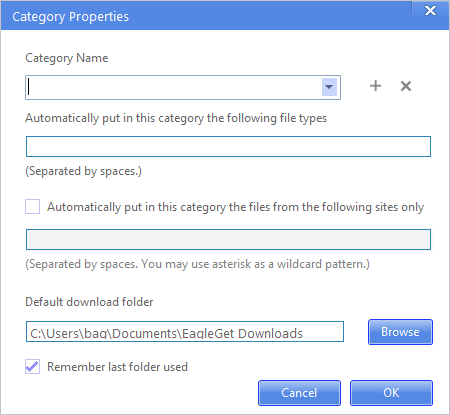 Make it a point to download softwares from their homesites or reputed download sites only... Softwares may connect to internet for various reasons, for instance checking for updates. This doesn't mean that's an illegal activity. This section is undergoing a major update at the moment. What kind of illegal activity did you notice with FDM? I've been using FDM for a while, on Vista using FF & Chrome, and now on Windows7 64-bit with Chrome. I've noticed recently that it's been hogging a CPU, sitting in Task Manager at 25% (on a 4 CPU system) for hours on end. I've tried upgrading, and have had no response to a support request. Which Download manager is fastest? Dont want anything else.. There is no such thing as the fastest download manager. All download managers will give you almost the same speeds, and it will be close to the download speed provided by your ISP. What matters is interface, features that you want, integration with browsers, etc. Free Download Manager does NOT integrate with Chrome. If I want to download anything a right click produces zilch. In Monitoring, under Settings, did you click the checkbox for Google Chrome? I tried IDM, FVDownloader, Downthem all,DWHelper, FDM, ORbit, jordi(I know,wtf! right? ), DAM, wxDownload Fast - do u know what did I settled for? GetGo Download Manager 4.8.5.1687. worked for me like a treat. every thing else either broke down midway or halfway( the add-onns), some failed to re-assemble the multiple segments( few of the above mentioned DMs). but GetGo asks you whether you want split download or single file download (no. of split set to 1). worked like a charm.